Black-eyed peas are thought to be a lucky new year food in the South, and I’ve always enjoyed cooking with them at this time of year, as late December gives way to January. In the past few years, though, I’ve branched out and started to rely on them as an everyday staple legume. 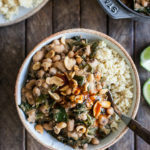 I love their subtly nutty flavor and aroma (I especially love using them in this dish, which includes the slightly surprising addition of peanut butter). 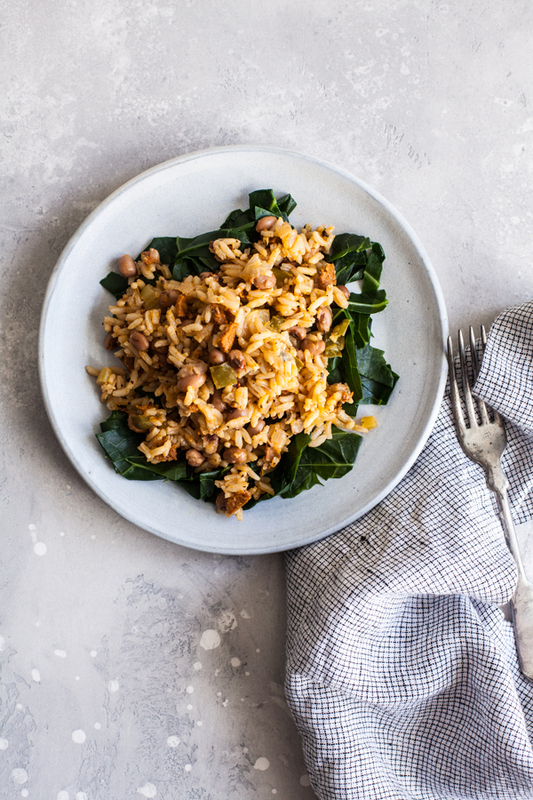 This easy side dish of vegan dirty rice & black-eyed peas happens to have come together right before New Year’s Eve, but I have a feeling I’ll be making it year round. It’s a flavorful, fast, and versatile base for simple dinners, burritos, and more. 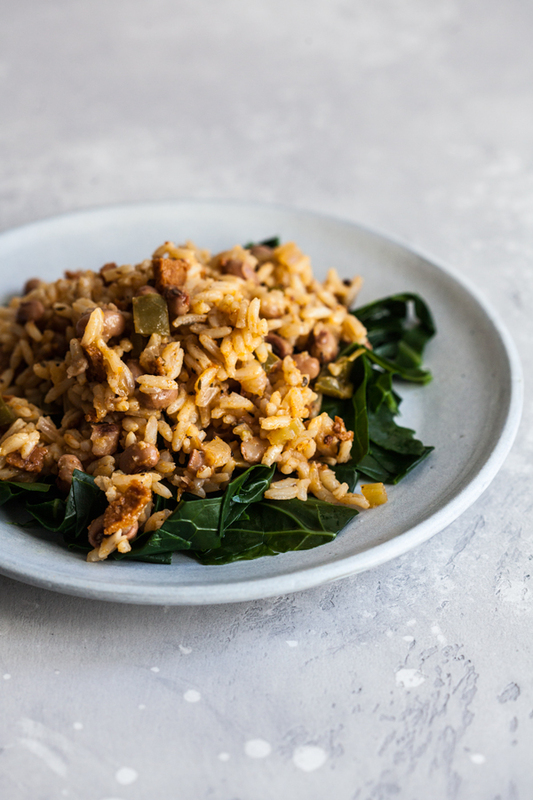 When I made it a few days ago, I served it with steamed collards, which are another good luck food in the Southern tradition. But I’m keen to try it with other greens, steamed or braised, and tonight I plan to top the leftovers with some of my vegan chick’n style soy curls. Traditional dirty rice, from what I understand, usually starts with bacon or pork and includes celery, onion, green pepper, and cajun spices (paprika, thyme, pepper). I’m not sure how authentic this version is, but I tried to channel all of those flavors, and I used vegan bacon to add smoky flavor and flecks of texture throughout the rice. My favorite vegan bacon right now is Sweet Earth’s, but you could use a homemade tempeh bacon, eggplant bacon, coconut bacon, or a brand name that you love. White rice is standard in the dish, but either white or brown long grain rice will work nicely in the dish. You’ll simply need to set aside a bit of extra cooking time if you choose brown instead of white. Vegan chicken style bouillon is a nice addition for saltiness, and I keep cubes in my pantry for when I don’t have stock on hand (also, to make those chick’n style soy curls). If you don’t have it, simply omit it from the recipe, adding salt in its place: the other seasonings add plenty of flavor as it is. Heat the oil in a roomy, deep skillet or medium pot over medium heat. Add the onion, celery, pepper, and bacon. Saute for 5 minutes, or until the onion is soft. Add the garlic and cook for another 1-2 minutes, or until the garlic is fragrant, stirring constantly. If the mixture starts to stick, add a few tablespoons of water along the way. Add the rice, water, both paprikas, thyme, salt or bouillon, and both peppers to the pot. Bring the mixture to a boil, then reduce the heat to low. Cover and simmer for 15-20 minutes (white rice) or 30-40 minutes (brown rice), or until the rice is tender and the liquid has been absorbed. Remove the rice from heat and allow it to steam, covered, for 5 minutes. Stir in the black-eyed peas, then taste the rice and adjust the salt and pepper as desired. Serve with steamed greens and other accompaniments of choice. *You can use water to sauté the vegetables if you prefer a no-oil option. Yum—I love all of the smoky flavor here! 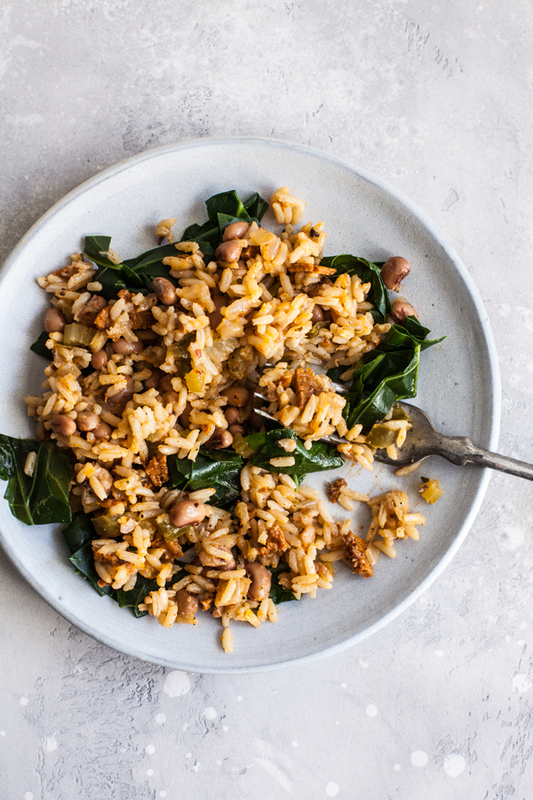 If you’re near the end of a batch of leftovers, you could try using the last of the rice and peas in a stir fry, adding whatever vegetables you’re keen to use up as well. That’s likely what I’ll be up to tomorrow and on Sunday, as 2018 rolls in. I’ll be back around in a couple of days for weekend reading, but if I don’t catch you then, I’m sending out warm and loving wishes now for a fulfilling, healthful, and peaceful new year. See you soon. 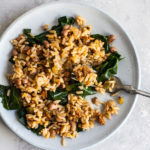 I absolutely LOVE this idea of using black-eyed peas in dirty rice. This looks unbelievably delicious and good for you! Thank you for sharing. It’s going on our menu plan ASAP! yep, love these legumes too, have been on a slow carb thing that requires legumes and quickly realized that my old black bean go to is just not as good as I thought so I’ve branched out into pintos and these too, and yes why not wrap in some good luck with the nutritional value, so thank you for this and really like the greens too, another of the three types of slow carb foods, bacon rounds it out nicely as a third component, nice recipe! Made this to celebrate the new year. I omitted the vegan bacon and green pepper but otherwise followed the recipe. It was so delicious and I would definitely make it again. I ate it with collard greens! This looks incredible! This dish takes us back to our adventures in New Orleans. We’re excited to try it! This sounds wonderful and the photos are stunning! Very nice, I love dirty rice! Have you tried it as just a side or main course? Also, are you a fan of vegan meat? If so, have you ever tried adding it to the dish? With a vegetable side, it’s a great main course, but it can be a side, too. I love vegan meats, but I haven’t tried adding them. I bet they’d be a lovely addition. I was just looking for a rice and bean recipe and woilah! Making me some Mexican type pulled seitan, this with some roast veg will work a treat. For the rice, is it okay if I used the cooked rice then add the seasonings? It’s like I often have rice after every meal, I want to use them to do something in a quick way, normally fried-rice. Yes! That will definitely work as a modification. I’d say 2.5-3 cups rice. This sounds delicious and easy. I just need to calculate the sodium amount in it. I may have to cut back on some stuff, but I’m used to it! 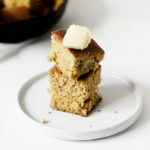 Dear Gena, thank you for sharing this recipe. I made it tonight and it was really delicious. I used spring greens (I’m in the UK and can never seem to find collard greens, but I think the two are close cousins at least!). Thank you again. Looks amazing!! Going to make this in the upcoming days!! Thanks for the recipe. Very nice one ..I liked it ! This is very good combination and looks very delicious and light.. thankyou for sharing this. Hooray! So glad you liked.